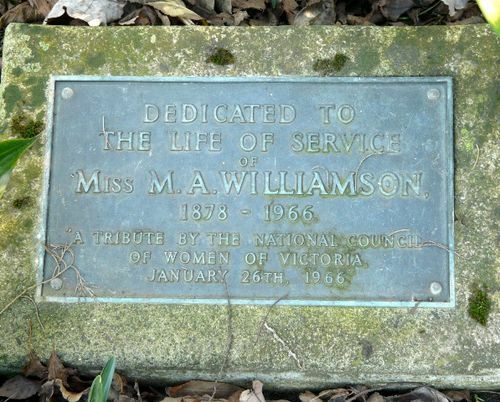 The plaque commemorates Miss M. A. Williamson (1878-1966) Life Vice-President of the National Council of Women of Victoria. Officially founded in 1902, with Janet Lady Clarke as president, and continuing today, the National Council of Women of Victoria is an umbrella organisation for a large and diverse number of affiliated Victorian women's groups. It functions as a political lobby group, attempting to influence local, state and federal government. Like all National Councils of Women, it operates though a standing committee system whereby specific issues are brought before the Council and, if there is general agreement that a question should be taken up, a subcommittee is established to investigate the matter. Until the 1940s at least, the Council was a major focal point for women's activism.